Ok, picked this little gem up today at a oddities store. Thought it was a deep red, then got it outside, in the sun, to find it was.................PINK! Oh well, that is what primer is made for, right? Pulled it out, now, I am going to sit and think about what I want to do. All in all, I picked this little gem up for $10. Everything is there and was sealed, but, I found that the bumper supports were broken. 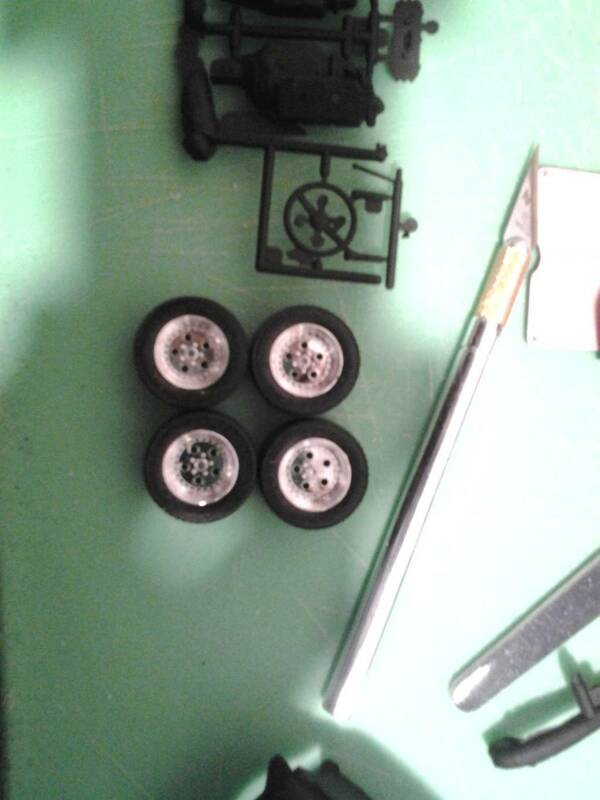 Well, I am not a fan of bumpers on a rod anyway, so, we'll see what I do to fix that little issue! Nope, won't do it. 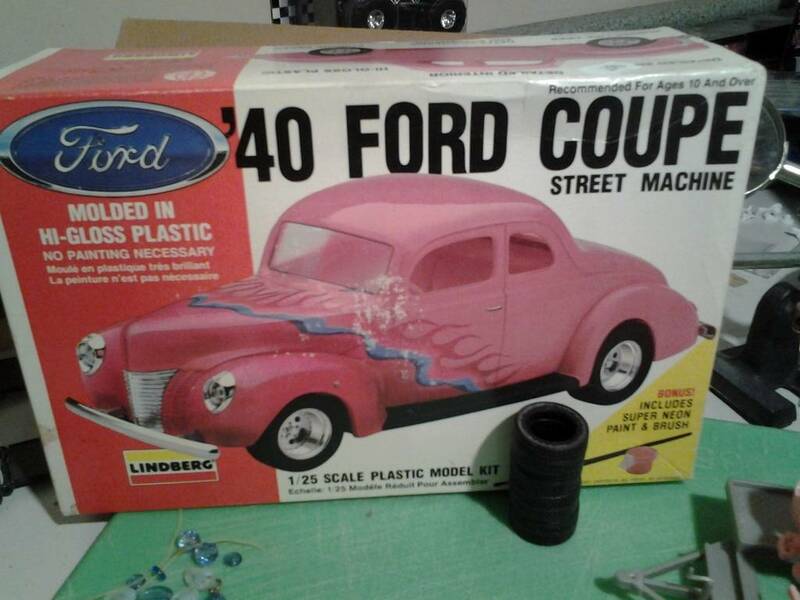 I already have a 50's caddy that is pink, that's enough for me. I have decided to call it "Redemption"
Thanks Gohk, you got me naming them now. Ok, why are my pictures being cut? Is there a size I should make them when I insert them? Yea, I am not finding a lot of flash, but, the area it is connected to the tree seems to be extra heavy on plastic. I am hoping tomorrow or Thursday. Been hectic here the last couple days. So, another update. 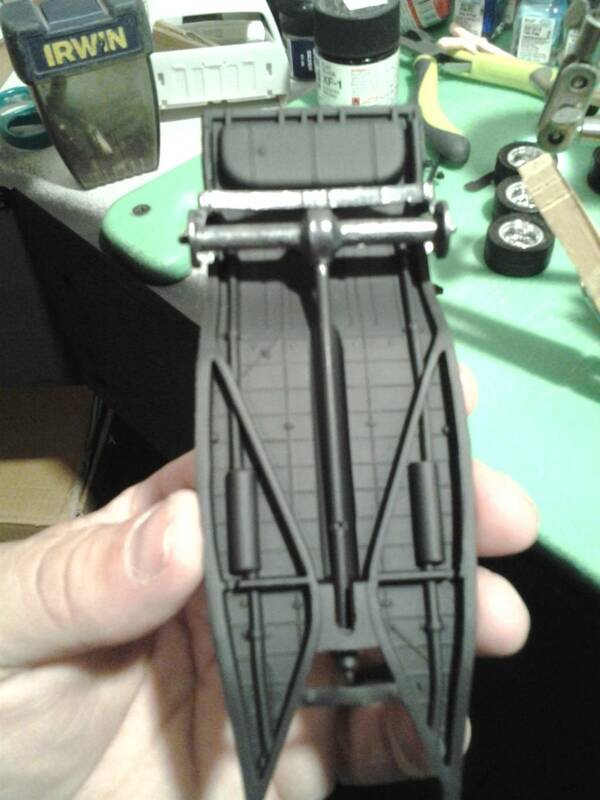 This is the undercarriage. 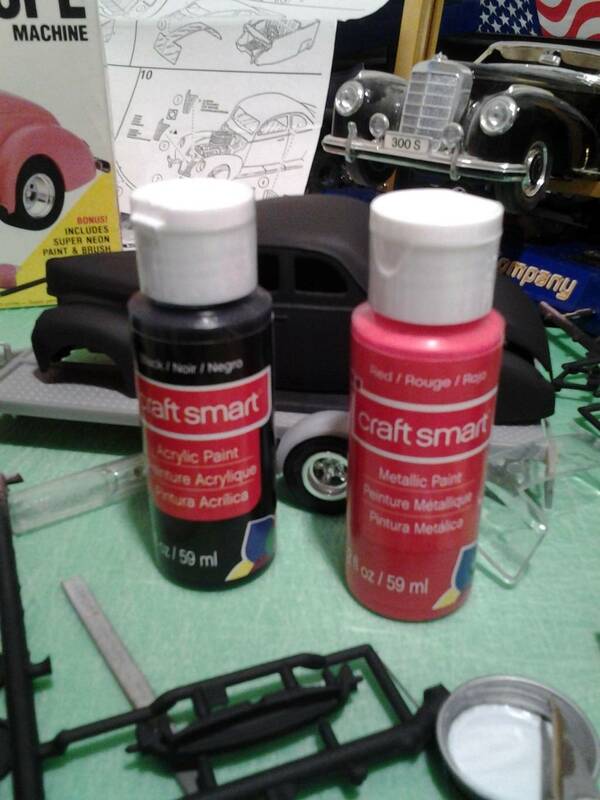 I picked up some acrylic paints at Michaels the other day, saw one called gunmetal, thought that would work great for the parts I don't want flat black underneath the car. First, this is my new, fancy paint booth, where I sprayed the parts a flat black primer. These are the rims and tries I will be using. They are box stock, but, I really like them for this kit. Not sure how I want to finish them, leave them chrome or see if I can't get a transparent red on them. The body really looks pretty good flat black. I am trying to decide how I want to do the red/black colors. These colors will go inside, as well. 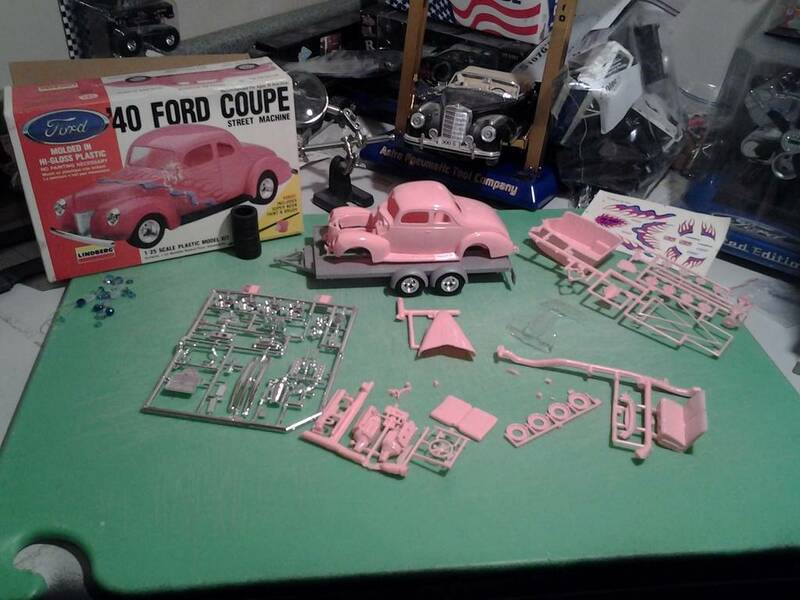 I am trying to get the engine block to be ford blue. I think I have the right tone of blue, or at least close enough. Here is the rear, painted gunmetal, glued in. looking good there Fletch. looks way better flat black than it would in pink. 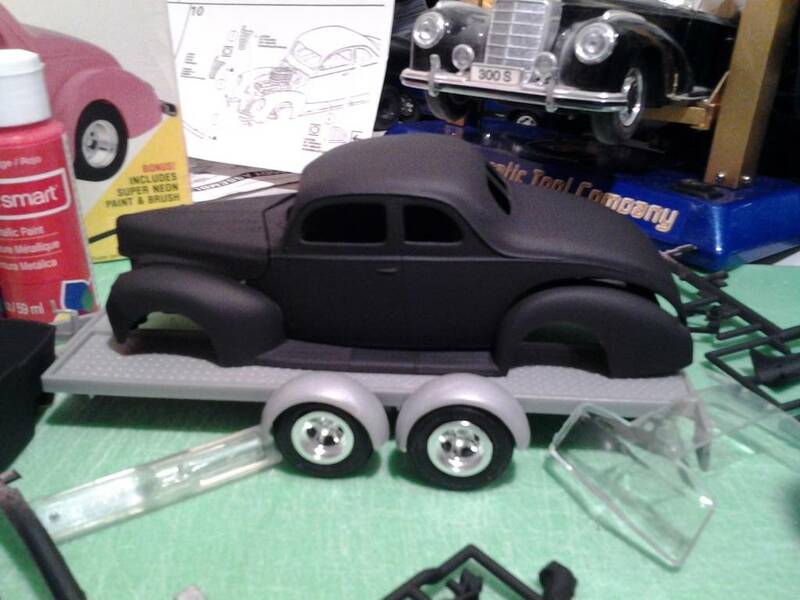 in that first pic I first though you painted it with some type of smoke chrome paint. must have taken the picture just after you sprayed the primer. Actually, That may be a part of it, but, I also put the LED light in the box and took the picture with my old phone, which always messes up the picture. 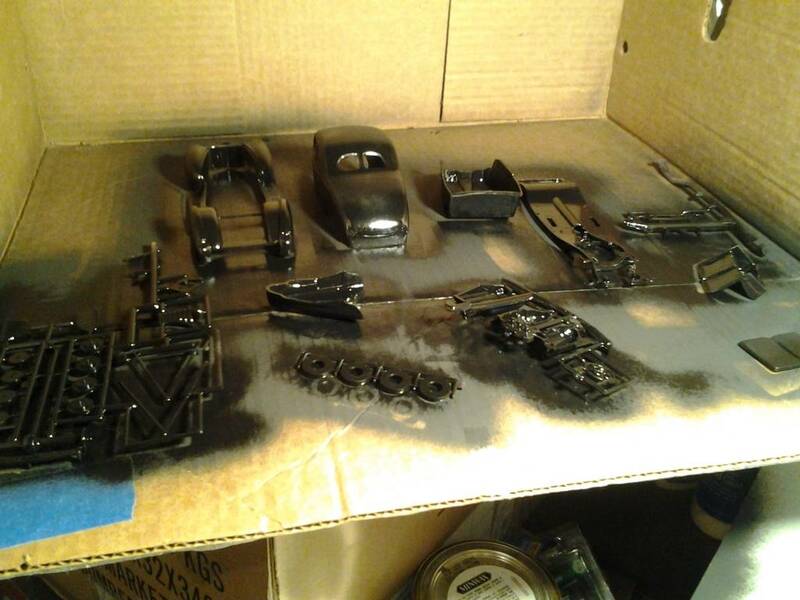 I am going to leave the majority of the car flat black, I just taped of the area I am going to spray flat red, so, as soon as my compressor and air sprayer are hooked up and ready, i will be slinging some paint. I have to check out Kit's article on airbrushing with acrylics again. He had a great article, i just need to re-read it. I think the engine i have is a 427. Hey, Wayne, you did an article or tutorial once on airbrushing with acrylics. What to use and how to thin it. I thought you used some alcohol in the mix, to get a good spray. Could you re-post it? fletch wrote: Hey, Wayne, you did an article or tutorial once on airbrushing with acrylics. What to use and how to thin it. You can use windex to cut acrylics,mix to about consitancy of milk, and yep you can use the same to clean the airbrush, orrrrrrrrr, you can use mineral spirits. BTW this is looking kewl Sketch, keep it going. I tried windex once, it left blue spots. So, what and how do you use the floor stuff? Sorry for the confusion. I am remembering multiple things about paint and cannot find the links, so, I think I may be mixing things up a little bit. I am hoping to put a matte finish on this. Ok, I am reading this again and I need to ask some questions to confirm. The water/alcohol/dish det. mixture is a mixture in itself, to be mixed in a container. Once it is mixed, is it a 50/50 mix with the paint? Believe it or not, getting everything for the paint, to mix the thinner and figure out what I want to do, exactly, with the paint scheme. The paint is kicking my but. I do not want to screw up the paint, so, I think I am psyching myself out and putting it off. I keep using my garage being a total mess as an excuse as to why I am not working on it. 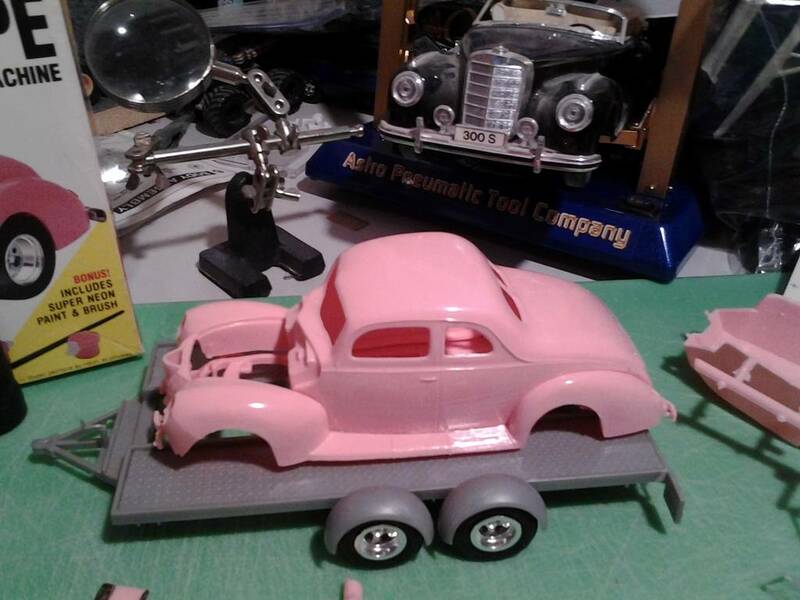 So, this week and weekend are kind of full, with the Holiday season on us and all, so, I am trying to make sure to set aside a few hours to actually get everything mixed and figured out, so that sometime next week, I can finally lay down the paint I want on the car. 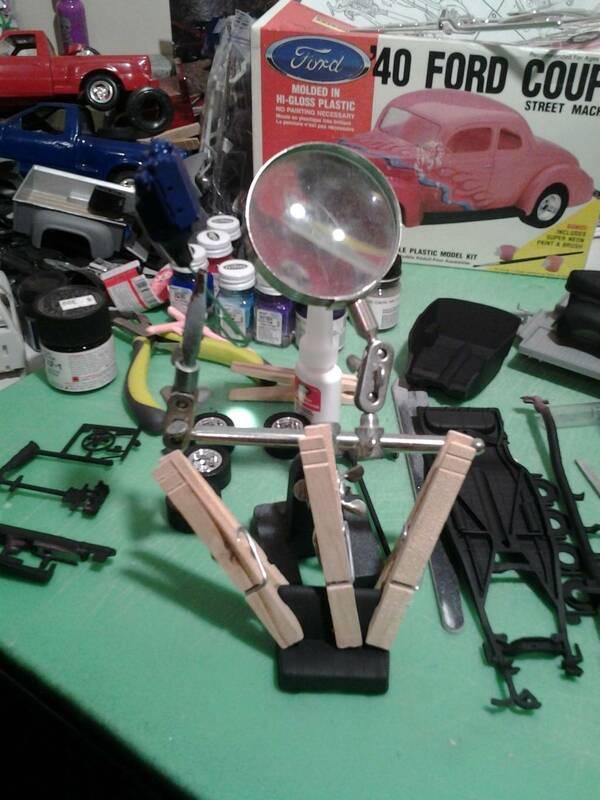 I feel like I am getting ready to paint a show car.